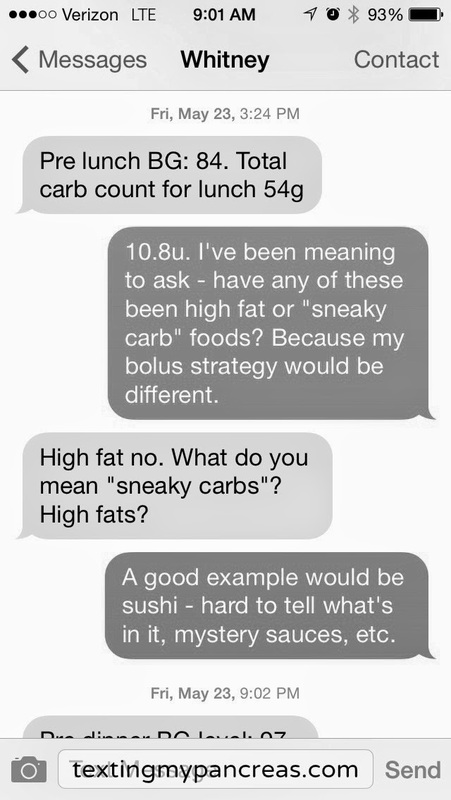 Texting My Pancreas: A "Fakebetes Challenge". Do you know Michelle Litchman? She's a Utah-based nurse practitioner who is very active on social media and she does a lot of good work for people with diabetes. 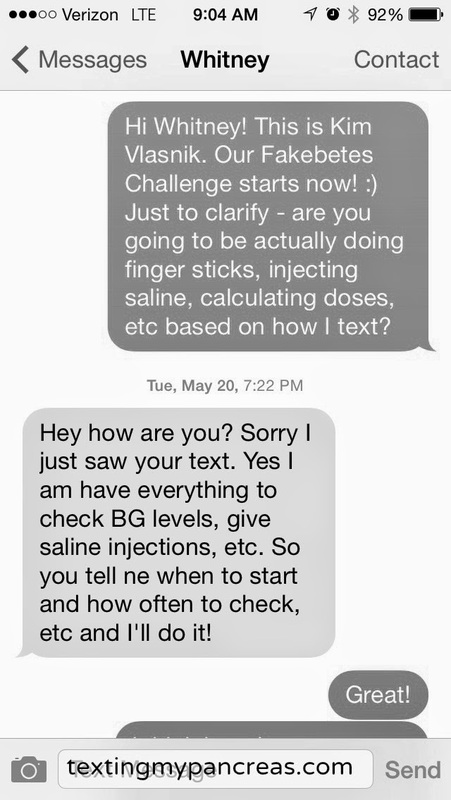 Among her many brilliant ideas lives the Fakebetes Challenge, where healthcare professionals pretend to "live with diabetes" for a week by taking saline injections, doing fingerpricks to check their bloodsugars, counting their carbohydrate intake, and corresponding via text message with a real-life diabetic. 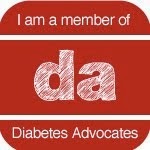 A few weeks back, I was one of those real-life diabetics. Kim will decide when the fakebetes challenge will start. Since no one gets to choose their diagnosis date, Whitney doesn't get a say in this. The challenge will last 1 week. Whitney will be expected to test her blood sugar before meals and at bedtime. There may be times when an additional blood test is needed in the event of hypoglycemia or hyperglycemia issues. Whitney will be expected to take her saline injections as follows: 22 units of "long-acting" saline once daily, 1 unit for every 8 carbs plus a correction of 1 unit for every 30 points greater than 130 of "rapid-acting" saline. 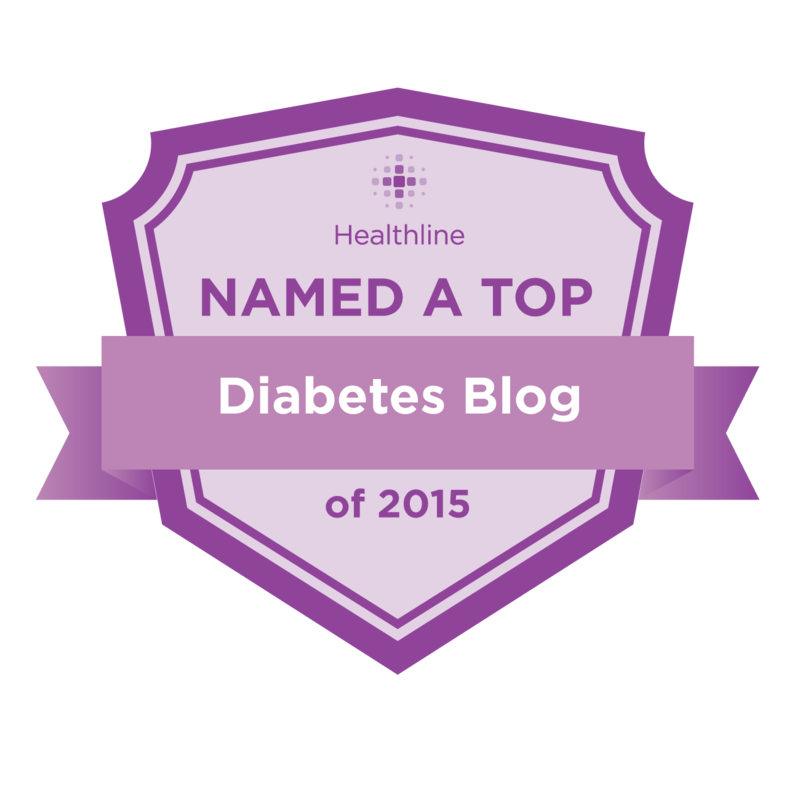 Adjusting insulin as needed for hypoglycemia, exercise, etc. Whitney is to notify Kim of what dose she took, how many carbs she ate, and if she is exercising. Kim will be expected to feed Whitney blood sugars to work with. These may be real blood sugars she is actually experiencing, or made up. She may choose to decide to send Whitney different readings based on what Whitney is doing. Kim may also opt to send symptoms instead of glucose readings (ie. feeling shaky, sweaty, etc.) which should prompt Whitney to check her blood sugar. Please connect so you can decide the best way to connect with each other. This may be by text, email, facebook IM, etc. Whatever works for you. Whitney, who is a newly-minted RN, went through some of the mechanics of diabetes for one week - pricking her finger and checking her BG using a borrowed glucose meter; injecting herself with saline (in lieu of insulin); keeping a written log of everything she ate. 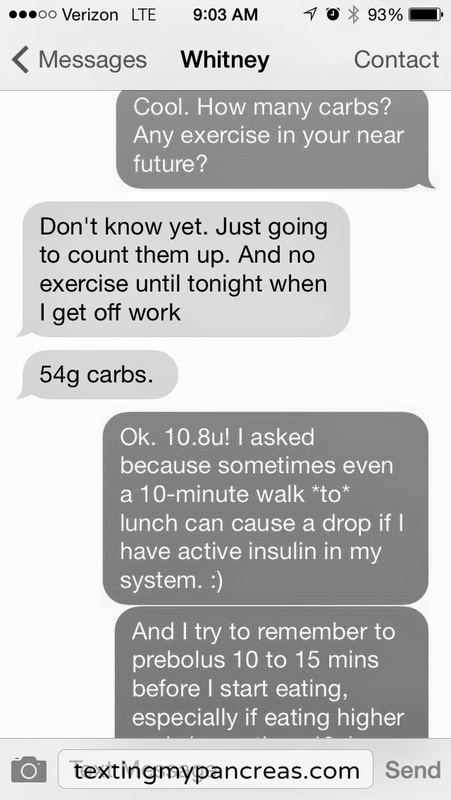 We used my BG readings to determine her doses, while using her carb counts and exercise plans. This week-long exercise gave me opportunities to bring up some of the quirks of my own life with diabetes - that even small amounts of exercise can cause significant drops in my BG; that I am extremely insulin-resistant while sleeping; that some foods contain what I refer to as "sneaky carbs". wondering "what is true and what is foreign when everything is covered in the same gray dust"
I have great respect for any health care professional that voluntarily signs up for a challenge like this - even if it isn't a full (or, arguably, even a half) picture of what living with diabetes is really like, it's a glimpse that many of their peers do not have the chance (or desire) to experience. Whitney was so open to learning and asked great questions, and I hope she found our interactions worthwhile. I would encourage future healthcare providers to take advantage of opportunities like this, and I hope that this type of make-believe helps to shape their future care with the empathy and understanding that their patients most certainly will need. You can find Whitney's point of view on our Fakebetes Challenge today on Michelle Litchman's blog. Wow, Kim- I'm impressed! This is no small challenge...for either of you. I'm surprised you threw the curveballs with an explanation, though. In real life, they usually just hit us squarely in the face, and only later do we get the chance to put together the forensics and try to figure out what happened. Well, Scott, a lot of the purpose behind this exercise was to educate - so that's what I tried to do. Fascinating stuff... I was hanging on every word. Thanks to both of you for standing up to the challenge! This is so cool! I can imagine you were a little burnt out. When I live tweeted just one day with diabetes, I was exhausted. You go girl! Or actually, You go girls!!! I'm exhausted just thinking about all of the variables you could throw her way. I think this is the right step for patient understanding and potentially empathy - even if we can't touch on every mental and emotional aspect of diabetes, this is a great way to start that conversation. This is so cool! You gave her a real workout.